Increasing the line height above the default settings can improve the act of reading. The space between lines is an important factor of readability. The white space helps the eye track a line of text. If the space is too small adjacent lines of text can confuse the eye. If the space is too large the eye will have problems finding the next line of text. The typical default line height spacing is approximately 100% to 120% of the font size or 1.0 – 1.2 ems. Good settings for low-vision are often in the region of 140% of the font size. The line adjustment of the height value varies from typeface to typeface. 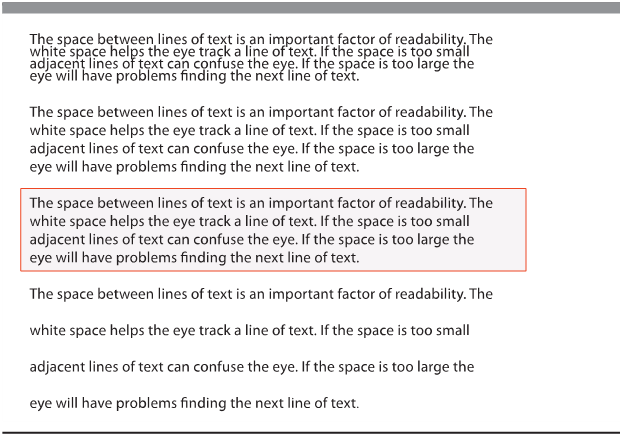 The space between lines of text is an important factor of readability. The white space helps the eye track a line of text. If the space is too small adjacent lines of text can confuse the eye. If the space is too large the eye will have problems finding the next line of text.